Celebrating twenty years in 2018, Artlands is a national event designed to reflect and respond to emerging trends and shine a spotlight on Australia’s regional arts. 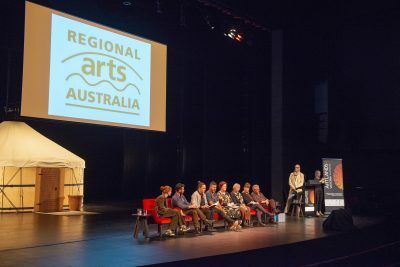 RAA has a critical role as a provocateur in contemporary regional culture with a renewed currency to facilitate ideas and engage across the sector with national and global reach. This is exemplified through diverse projects and agendas, building audiences and creating connection through the arts and creative industries. RAA’s guiding principle is that place is central to creative practice and provides profound practical and emotional links between the economies and synergies of artistic and cultural practice. 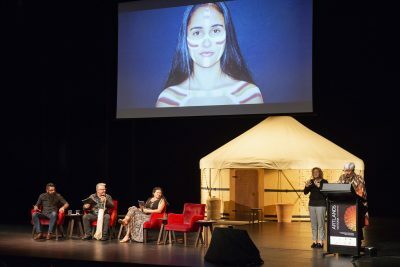 Artlands is lead by First Nation dialogue and practice On Country and will continue to be cross-disciplinary, interconnected and intergenerational. The 2020 Program will be designed to showcase contemporary artists and new thinkers that influence the way we engage with regional arts and its processes. Critical conversations on key themes – from health and well-being to innovative practice across industries, Indigenous practice on-country, developments in technology will be explored.